Good afternoon, my friends. I hope your Monday is going well so far! My mom will be arriving in town soon and I’m excited to have a visitor for a few days! She was in Pennsylvania with my grandma and aunt this weekend as they officially sold my grandma’s house (<— lots of emotions going on related to that one) but I am excited she’ll be swinging by our house on her way back to Florida! I’m hoping to show her around a little bit today, grab dinner out somewhere tonight and then possibly take a Jazzercise class or something tomorrow morning. I’m ready for some quality mother/daughter time! But for right now, I’m here to share a back to basics arm workout with you guys! I actually put this quickie workout together when I was in Boulder two weeks ago. I wanted to sneak in some strength training at the hotel gym one morning and since my time was limited, I decided to concentrate on my biceps, triceps and shoulders. Tricep Push Ups <—We do these in Pure Barre all the time and they’re killer! Bicep Cross Body Curls <— Is this Katrina from Tone It Up!? It looks just like her! This workout is the kind of strength training I find myself doing when I want to do something simple that only requires a set of dumbbells. (I actually did it again at home this weekend as I finally wrapped up Orange is the New Black.) It’s a great at home workout option for those of you out there who may be looking for a quick arm workout you can do in your living room! A quick note for those who may not be familiar with trisets: During the BONUS round, you’ll complete a triset which is similar to a superset but with three exercises instead of two. To complete a triset, you’ll perform three different exercises one after another, without any rest in between. Julie – slightly off topic question for you, but how do you keep your strength up when training for a half marathon? I am training for my second one right now, and my biggest complaint with the first one is that I lost a lot of the strength I had gotten when I was just doing regular workouts/body pump/etc and not running 4-5 times a week. I find it to be a struggle to incorperate too much strength training excercises during the week because I don’t want my legs/body to get too sore & then not be able to do my runs. Any recommendations? Hi Allie!! Usually when I train for a half, I only run three days a week (that includes one long run), so I just focus on strength training on the off days! You may not need to be running quite as much! Are you following a specific training plan? I obviously don’t want to steer you away from your personal training plan, but for me, three days a week of running for a half works really well. I don’t get burnt out on running as much and I still have room in my week for other workouts I love. Loving arm workouts because I always neglect them, but know they are so important and look amazing when I put in the work! Great workout! I love working arms. Always feel strong and in control. Love a good upper body workout! Enjoy time with your mum! I hope you were sore in a good way! 🙂 And thanks, Emily! Enjoy your mother/daughter time! That is great she is going to visit. I just finished Orange is the New Black too! The last epside of the 2nd season blew me away. Thanks for the workout! I KNOW!!! The ending totally surprised me… but I, personally, liked it! Great arm workout…I do one pretty similar. Have a great time with your mom. Basics are my sweet spot! And also YAY for finishing Orange is the New Black! The season 2 final was CHILLING and I loved it! Love the workout–pinning! Have fun spending time with your mama! aww have fun with your mom!!! This is a great, simple arm workout to keep on hand when I need a quick strength workout! Enjoy seeing your mom! I can never work out and watch tv at the same time! You’re dedicated, girl, tv is my veg-out time haha. I totally need to do this workout! I have been slacking lately with lifting. It is always my weakness, but I realize that it is sooo important! 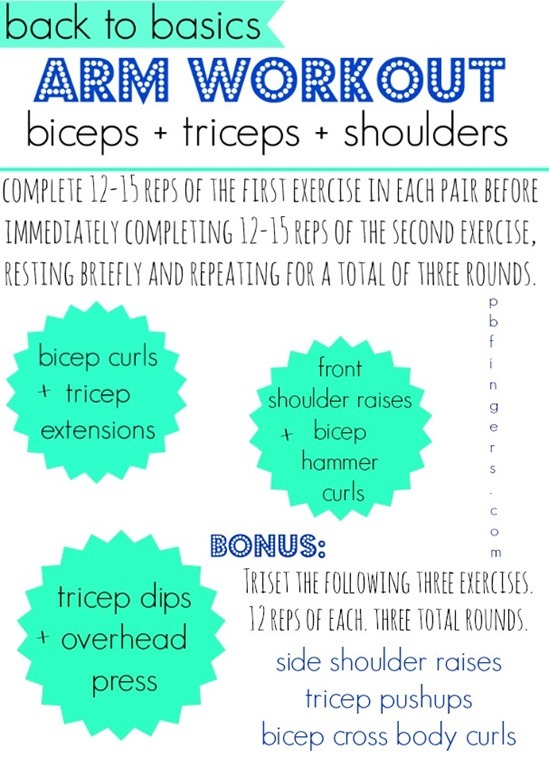 I think upper body workouts are my favorites, I’ll be trying this one soon. I might just have to add this workout to my routine today. Thanks! Great workout. A lot of my workouts tend to be supersets of exercises due to my time availability. I really enjoy them though because it is a great way to quickly fatigue the muscles and work them to capacity in a small time frame. I love your workouts! so simple and fresh and fun! needed this! Can’t wait to try. I tend to do the same arm and squat routine and it’s just getting boring and old. I love working out arms. Thanks! Do you do each set of 2 exercises 3 times and then move onto the next set or do you do the whole workout and then repeat?